Species conservation programmes can and do reduce poverty, increase participation by women in society, improve governance structures, increase food security and, of course, deliver a sustainable environment for future generations. Around the world, billions of dollars are being spent to reduce poverty and promote sustainable economic development – often with inadequate attention to the link between sustainable development and a healthy environment. In many parts of the world, the dynamics which threaten species are also those which contribute to poverty, such as loss of habitat and its riches, unsustainable depletion of the natural resource base, inequitable access to natural resources necessary for life, and a lack of appropriate governance and management mechanisms. The challenge for governments, scientists, industry, non-governmental organizations and communities is to embrace both the challenges and the opportunities of species conservation and to deliver integrated conservation and development outcomes. The results will improve the status of species and the communities, which, ultimately, are the custodians of their habitats and populations. 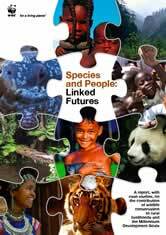 Species and People: Linked Futures - This report, commissioned by WWF and drawing on over 40 years experience in the field of species conservation, uses case studies from around the world to demonstrate that species conservation can, and is, contributing to sustainable development as measured against the achievement of the Millennium Development Goals (MDGs). A species conservation approach that is integrated with human needs is fundamental to the fulfillment of WWF's mission.